I find myself rather indignant that poor Mr. Arndt could go to the trouble to write on a subject as narrow as reflexive pronouns and have others blithely disagree with him. What gall! I may have to champion his cause just on general principles. pster wrote: I find myself rather indignant that poor Mr. Arndt could go to the trouble to write on a subject as narrow as reflexive pronouns and have others blithely disagree with him. What gall! I may have to champion his cause just on general principles. I too feel for Arndt, and may rally to his banner after all. Do you still like the way you put this? Usually, it refers to the main subject. I see now via Nate and Smyth that Thucydides sometimes breaks that rule. But you make it sound here like he usually breaks the rule. Am I missing something, or did you overstate things here? Next question: Hobbes seems to go for the boeotarchs doesn't he? UPDATE: No he doesn't. I got this wrong. Last edited by pster on Fri Feb 01, 2013 8:53 pm, edited 1 time in total. Also, here, don't we have three levels? A main clause, an intermediate relative clause, and lowest level relative clause? The first is the level of οἰόμενοι, the second is the level of ψηφιεῖσθαι and the third is the level of προδιαγνόντες παραινοῦσιν? UPDATE: This is the thing that is adding to the headache that I have from earlier. This seems to be a special case because of the three levels, but I am the only one talking about that. Last edited by pster on Fri Feb 01, 2013 8:55 pm, edited 1 time in total. σφίσι : refers to the subj. of ψηφιεῖσθαι: “they would adopt no other measures than those which they (the Boeotarchs) recommend to them after previous deliberation.” The indir. refl. pron. often refers in Thuc. to the subj. of a dependent verb. Cf. i. 20. 10; 30. 14; 58. 7; iii. 3. 19; iv. 113. 11. Kühn. 555, N. 9. The change to σφεῖς or ἐν σφίσι, which has been proposed, is therefore unnecessary. Seems right to me. Would have been nice if Hobbes had explicitly inserted the dative in the English. So I don't think we need the Smyth/Nate special sauce. But I am sure I have missed something very basic. So what is it? I guess I don't like the way Fowler puts it when he says: "The indir. refl. pron. often refers in Thuc. to the subj. of a dependent verb." In this case, the pronoun does point to the subject of a dependent verb, but the verb is still at a higher level than the pronoun. I haven't looked a the other examples yet, however. Sorry John for making a mess out of your question. I like Hobbes and Fowler. So I guess I'm against Arndt. UPDATE: But I'm not going to pass final judgement until I have read Arndt. Do we have a link? pster wrote: Sorry John for making a mess out of your question. I like Hobbes and Fowler. So I guess I'm against Arndt. pster - many thanks. I'll consider your comments in detail and get back to you ASAP. And please don't apologise - it's good to bounce things around and try to get to the bottom of them . Re Arndt, all Krueger (commenting on 5.38.3) gives by way of reference is 'Arndt De pron. refl. I p. 84', from which he apparently quotes 'quae ipsi secum antea deliberata' as Arndt's rendition of this passage. The bibliography at the start of Poppo-Stahl's edition includes 'Arndt De Th. arte scribendi dissertatio, Magdeb. 1865', which presumably refers to the same chap. I haven't yet found anything on line - perhaps I'll have to make another trip to the British Library! By the way, I'll be replying to Daivid re Thucydides 1.22.4 on his Herodotus thread in case it's of interest to you. because it is the nearest subject to the pronoun, just as Smyth and Fowler noted. The recommending is done by the Boeotarchs to the Council. Nothing in here suggests he's reading σφίσι as referring to the Boeotarchs. Here are some good resources. They have other authors too. 1) Smyth makes it really confusing. I am not sure whether that is because he is just regurgitating Kühner-Gerth without first digesting it, or because he insists on discussing ἑαυτῶν and σφῶν forms at the same time. This is a case where Mastronarde is much easier to use. 2) Mastronarde tells us that the σφῶν forms are indirect pronouns. They don't refer to the subject of their clause. 3) Usually, there are just two clauses, so grammarians will say that the σφῶν forms refer to the subject of the main clause. But when there are three or more clauses, we need to realize that they are going to refer to the subject of the clause one level up. There seems to be lots of needless confusion about this. Better yet, I think it is best just to think of them as referring to the "other guys/things", ie not the first guys/things you might think. The completely unqualified armchair linguist in me thinks that this is all that was going on. The Greeks had the ἑαυτῶν forms when they needed a reflexive pronoun. But when they wanted to refer to the "other guys/things" who are in the picture they pulled out the σφῶν forms. 4) In Th. 5.38, I think the pronoun has to refer to the councils. Fowler gets it right, but he muddies the water when he explains it. Yes, here it is referring to the subject of a dependent verb, but that is only because there are three levels. 5) Graves seems hopelessly confused simply because of the three levels: "[in the other examples] it does refer to the general subject of the sentence, which is not the case here." That's right, because there aren't three levels in the other sentences. He cites Th. 1.20 and 4.113, both of which are unproblematic. 4.113 is interesting because, thanks to our friend osos, the subjects are the same, and the pronoun actually refers outside the whole sentence! 7) I am most interested in particular sentences that are thought to present difficulties for this general line of thinking. I'm sorry, after five hours of thinking about it, I don't see anything very troubling. I think you are misunderstanding the register I use for this stuff. While it is true that I don't treat any of them with reverence--having a hard time thinking of anybody or thing, especially a scholar, that I treat with reverence--any disparaging is of the faux semi-tongue-in-cheek variety, partly to make them come alive and mostly just to make the terms of the debate clear. On internet forums, there is a great deal of people talking past each other, one person making a subtle point, the other making a banal one, one making jokes, the other getting offended. Ends up wasting a lot of time. So I try as much as possible to draw my own position in rather cartoonish terms for the sake of clarity. It will be another decade at least before I pass final judgement on any professional classicist. is a great site that I have mentioned before that gives you a quick way to see all the instances of a word in a given book of Thucydides. Just fiddle with the URL to get other books since navigation isn't straightforward. Just in book I, there are too many instances for me to look at. But Smyth's rule strikes me as rather odd. Why not just say, "the subject of its own clause"? Are we supposed to imagine that there is some difference? But leaving that aside, I'm interested in other instances from Thucydides that seem to break what I take to be the general rule of just finding the referent one level up. According to Smyth, there are other places. Do we know of any besides 5.14 so that I can have some more practice explaining away anomalous cases? pster - many thanks for this. In the light of your comments (and those of Nate, to whom too many thanks) I'm now taking σφίσι with the subject of ψηφιεῖσθαι, i.e. the Boeotian councils. Your working principle of 'one level up' appears (subject to any further thoughts you may have, or any contrary results which may emerge) to be a useful rule of thumb. It seems to be the case that some commentators and grammarians rather muddy the waters by not expressing things in as clear a manner as might be wished. I wonder whether the sheer length and complexity of some of Thucydides' sentences, and the degree of subordination within them (all of course very characteristic of his style) have led to confusion on this point. Certainly - for whatever reason - this instance at 5.38.3 has caused a fair bit of angst among quite a few fine scholars. pster - if you've still got your Hornblower handy, could I possibly ask you to check what he says about one point? The crux is whether the Athenian alliance which the Egestaeans are invoking here was with themselves or with the Leontines. A Historical Commentary on Thucydides (HCT) by Gomme et al. takes the view that the alliance was with the Leontines (as does George Cawkwell in his Thucydides and the Peloponnesian War), in which case ξυμμαχίαν will go with Λεοντίνων. Others think that the alliance was with the Egestaeans themselves, in which case ξυμμαχίαν will refer to 'the alliance [with the Egestaeans]', and πολέμου Λεοντίνων will go together - 'the war of the Leontines'. I'm not sure about the latter interpretation, however, as I can't recall a similar usage in Thucydides where only one party in a war is mentioned with a genitive: at 1.1.1 there is τὸν πόλεμον τῶν Πελοποννησίων καὶ Ἀθηναίων, where both parties are mentioned. Anyway, I'd be most grateful to know how Hornblower takes it. Although I've pitched this at pster, any comments from others would also be very welcome! much of it but it may be of some help to you. There is a several page discussion of the sentence. Its meaning even hinges on the results of an examination of an inscription with a laser! Looks like fun. I'm up for it, but it may take me a few days to summarize it for you. Nate - many thanks for this. I have to say that, at the moment, I'm not keen on the Smith view, as surely what the Egestaeans would invoke, in appealing to the Athenians for help, would be an alliance made by the Athenians themselves with another party, and the obligations this imposed on the Athenians. I'll have to think about it a bit more, though. pster wrote: There is a several page discussion of the sentence. Its meaning even hinges on the results of an examination of an inscription with a laser! Looks like fun. I'm up for it, but it may take me a few days to summarize it for you. pster - many thanks indeed, but please only do this if you really have time; otherwise I'll go up to the British Library to consult Hornblower. As I understand it from Cawkwell's book, the inscription relates to an alliance betweem Athens and Egesta. The last two letters of the archon's name appear to be 'O[=omega]N', and traditionally this has been taken as referring to Habron, who was archon in 458-7; however, one school of thought claims that the name is 'Antiphon', basing this on an alleged trace of an iota (found by laser anaysis) at the appropriate point in the inscription. if so, this would have implications for the plausibility of Thucydides' account, as Antiphon was archon in 418-7; since the Egestaeans' appeal was being made in 416-5, they would surely have simply invoked this recent alliance, rather than one made (whether with the Egestaeans themselves, or with the Leontines) in the previous war, and Athens would surely have had to agree to help at once, rather than sending observers before deciding. I should, however, add that Cawkwell himself is sceptical, and thinks that the alleged iota is part of a longer mark - perhaps a scratch - which is visible above it. Anyway, it will be interesting to see Hornblower's take on all this! Hornblower says he adopts the interpretation that it was an Athenian alliance with Leontinoi, the same interpretation as most translators going back to Hobbes. There are two other interpretations: Egestaian alliance with Leontinoi going back to Vala in 1400's; and Egestaian alliance with Leontinoi held by Steup. Hopefully that will keep you busy for a day or two until I can read some more Hornblower! Funny I was just looking at vacation ideas in northwest Sicily. I may have to go look at this inscription myself. Where is the stone? pster wrote: Hornblower says he adopts the interpretation that it was an Athenian alliance with Leontinoi, the same interpretation as most translators going back to Hobbes. There are two other interpretations: Egestaian alliance with Leontinoi going back to Vala in 1400's; and Egestaian alliance with Leontinoi held by Steup. I'm very grateful for the link to the paper by Chambers et al., which is referenced by Cawkwell as the source of the 'pro-iota' (i.e. Antiphon) argument. I haven't yet read it in detail, but they refer to theories that Thucydides (a) was simply unaware, owing to his exile, of an alliance in 418-7, and so based his explanation of Athenian involvement on appeals to an earlier treaty, or (b) got the date of the Egestaeans' appeal wrong, so that it in fact preceded, and actually led to, the alliance of 418-7. As I said before, however, the iota is by no means universally accepted, and is rejected by (inter alios) Cawkwell. From the article it appears that the inscription now resides in the Epigraphical Museum in Athens, so not one for your own 'Sicilian Expedition', I'm afraid. Most Thucydidean sites in Sicily are on the east/southeast coasts of Sicily, but perhaps you'll have time to make it over there; I'd certainly like one day to see Syracuse, and the quarries into which the Syracusans, as so memorably described by Thucydides, herded the survivors of the Athenians' ill-fated expedition. Stupid question I'm sure: Can either of you explain the meaning of ἐπὶ here and what it governs? Let's assume the Hornblower interpretation. Hornblower's translation isn't tightly literal. If the alliance was between the Athenians and the Leontines, how is this supposed to be translated? Hornblower follows Dover (who has the same view of the alliance) in saying that πολέμου and Λεοντίνων are not to be taken together, that Λεοντίνων is so far from ξυμμαχίαν because of hyperbation in the service of emphasizing the unusualness of the Egestaeans' appeal. Does ἐπὶ Λάχητος καὶ τοῦ προτέρου πολέμου just mean "in the time of Laches and the former war"? But if that is so, then how can Hornblower say that Hobbes got it right? Hobbes seems to take πολέμου and Λεοντίνων together. Does ἐπὶ Λάχητος καὶ τοῦ προτέρου πολέμου just mean "in the time of Laches and the former war"? pster - that's certainly how I take it: I've translated it as '... reminding the Athenians of the alliance with the Leontines which had been made in the time of Laches and the previous war ...'. John, are you satisfied? Or do you still want to hear more about Hornblower? I've got about a dozen things going on now, so have been limiting the Greek to 60 minutes. Did you read that pdf? pster wrote: John, are you satisfied? Or do you still want to hear more about Hornblower? I've got about a dozen things going on now, so have been limiting the Greek to 60 minutes. Did you read that pdf? pster - I think I'm fine now on this query, thanks. (ii) how does one interpret the actual text of Thucydides? Since you've advised that Hornblower endorses the position of HCT and Cawkwell - i.e that ξυμμαχίαν goes with Λεοντίνων - I've retained that interpretation in my translation. Soon after leaving port, my Thucydidean trireme was struck by a Polybian quinquireme. So despite spending the entirety of last year preparing for voyage, it has had to return to port for repairs. Plans are to resume in about 8 weeks! pster wrote: Soon after leaving port, my Thucydidean trireme was struck by a Polybian quinquireme. So despite spending the entirety of last year preparing for voyage, it has had to return to port for repairs. Plans are to resume in about 8 weeks! I'm glad to hear that repairs are under way, and I look forward to your rejoining the voyage across the vast sea of Thucydidean study! I had to read the Polybius for something else. I wouldn't have stopped Thucydides if it weren't for the proverbial two birds with one stone. But after I finished it, I tried to reread it, and it seemed as hard as the first time through, which perturbed me greatly. So now I am almost trying to memorize it. Add to that that I just started some other language courses and so have had to limit the Greek to no more than an hour or two. Now that I think about it, I suspect part of the problem is that the first few pages are made up of fragments and so don't have much continuity. Once again, I'm after a little help with Thucydides. As you will see from the above, the issue is whether the second clause refers back to the whole of τί ... λέγοντες εἰκὸς (option (i)), or just to τί alone (option (ii)). The commentators are divided on this; Dover inclines to option (ii), on the grounds that such trajection of ἢ is found elsewhere in Thucydides, and that this gives a greater symmetry between the two clauses ('by what reasonable argument could we ourselves shrink ...'/'with what excuse to our allies there could we decline ...'). Frost, in his edition of Books VI and VII, also takes this view, parsing the sentence as: τί εἰκὸς λέγοντες ἢ αὐτοὶ ἂν ἀποκνοῖμεν ἢ τί σκηπτόμενοι πρὸς τοὺς ἐκεῖ ξυμμάχους μὴ βοηθοῖμεν ἂν. On the other hand, the excellent edition of Poppo-Stahl supports option (i). So far I've favoured option (i), as in most cases of trajection of ἢ the sentence just won't work unless one assumes such trajection, whereas here it will (albeit at the cost of losing strict symmetry between the two halves of the sentence); now, however, I'm starting to wonder whether (ii) is correct. Any thoughts? Your views would, as always, be much appreciated. Hornblower is silent on the issue. I'll give it some thought Monday morning. pster wrote: Hornblower is silent on the issue. I'll give it some thought Monday morning. Thanks, pster. Ultimately it may prove to be yet another of those Thucydidean 'you pays your money and you takes your choice' issues, but as always I'd certainly welcome your insights (and those of anyone else who cares to chip in). Hey John. You finally have my attention. Sorry, I'm really trying to make do with 90 minutes max of Greek per day right now. I don't like (ii) very much. The second clause wouldn't refer to τί alone since we still have ἂν. I'm not even convinced much symmetry is gained. How much symmetry is gained I suppose depends on exactly how we understand (I was going to say the participles, but actually) all the words. I take λέγοντες εἰκὸς almost as a parenthetical, "our reasonably saying/thinking". But then what exactly does τί refer to? LSJ say that ἀποκνοῖμεν is abs. in this very passage. Does that mean not c. inf.? Or does it also mean not c. acc., ie intransitive? I just realized I don't understand ὥστε in an interrogative like this. Is it adverbial? Tell me what all the other words mean and I'll tell you what ἢ means. OK, following Sidgwick, I'm just going to take ὥστε as a way to link consecutive sentences. I really don't understand τί. Is it a direct object of λέγοντες? I would like it to be, but I don't ever recall seeing an interrogative pronoun governed by a participle. If not, then is it a direct object of ἀποκνοῖμεν? That seems kind of strange. Alcibiades knows full well what they are shrinking from. Nor does it seem to work as any kind of rhetorical question. So forget the second half of the sentence. I don't even understand the first half. pster - many thanks for your comments. I think τί ... λέγοντες εἰκὸς must go together, in the sense 'saying what reasonable thing', i.e. 'on the basis of what reasonable argument'. I take ἀποκνοῖμεν as meaning 'could we shrink from', with 'the expedition' (or 'undertaking the expedition') understood; I don't think it is absolute here in the commonly used sense of that grammatical term. You're right about ἂν being needed in both clauses, which in my view weakens the case for option (ii). Some translators/commentators try to have the best of both worlds, by taking εἰκὸς (but not λέγοντες) with the second clause, so that the latter then means 'or with what reasonable excuse ...'. Frankly, if one is prepared to go that far, one might as well go the whole hog and read λέγοντες with the second clause as well - which takes us back to option (i)! I'm also unconvinced by Dover's argument based on symmetry. 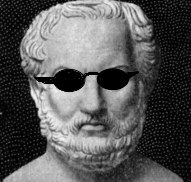 One should remember that another prominent characteristic of Thucydides' style is variation, so that things don't always have to balance precisely. In the light of your remarks, and of my own inclination, I'm minded to stick with option (i) - at least for now! I don't understand what τί could be for (ii). For you and for (i) it is an object of λέγοντες. What is it for (ii)? Especially for the second half of the sentence? Is it an object of σκηπτόμενοι? Of βοηθοῖμεν? One last point: I don't see the two disjuncts as being independent. The conjunction me thinks is really functioning as a conjunction. Consider: "I don't know what he was thinking or what his excuse is going to be." Most of the time, what he was thinking = his excuse. Are proponents of (ii) trying to open up the bit of logical space where the Athenians motives and what they tell the folks in Italy diverge? I just don't see what the reason for (ii) is. So: the symmetry argument seems bizzare in light of your saying that τί is an object of λέγοντες; and moving away from grammar to history, I don't see what purpose (ii) serves. LSJ cites this passage (among others, including Herodotus, Plato and Polybius) for the use of skeptomai with the accusative, in the sense of "put forward by way of support" or "allege by way of excuse." This would be reading the passage as your (ii). Personally, I'd be inclined to (ii) based on the need for a direct object for σκηπτόμενοι -- for me, that's the clincher. Also, the parallelism of the participles and optatives λέγοντες . . . ἀποκνοῖμεν and σκηπτόμενοι μὴ βοηθοῖμεν. τί goes with both participles (happens all the time in Greek) and ἂν goes with both optatives and I don't see a problem with the placement of the first ἢ -- doesn't seem out of bounds for Greek, and especially Thucydidean, word order. The two ἢ's placed as they are set up a contrast between the Athenians' own interests and the interests of their allies. pster, Qimmik - many thanks for your comments. pster - it may be that the proponents of (ii) are, as you suggest, trying to distinguish between what the Athenians would say among themselves to justify their not going, and what they would actually tell the Sicilians. I haven't seen this suggested explicitly elsewhere, but it's an interesting idea. Qimmik - I take your point re an object for σκηπτόμενοι, but does it have to be τί itself? Could it not be an understood pronoun/relative referring to τί? In other words, the construction would be '... or, using [it] as an excuse ...'. Is this a possibility? The placement of the first ἢ in relation to option (ii) is certainly possible for Thucydides, but it assumes a slight trajection, which option (i) avoids, though I certainly accept that this doesn't mean that option (i) is correct. I'll have to give this some further thought, and see if I can think of any Thucydidean parallels. I take your point re an object for σκηπτόμενοι, but does it have to be τί itself? Could it not be an understood relative referring to τί? In other words, the construction would be '... or, using [it] as an excuse ...'. Is this a possibility? I'm not sure I understand how this would be syntactically possible. And it strikes me that once you recognize that σκηπτόμενοι needs a direct object, τί is the logical choice (rather than supplying something that isn't in the sentence), especially since it yields the neat parallelism λέγοντες . . . ἀποκνοῖμεν and σκηπτόμενοι μὴ βοηθοῖμεν, with the contrast between the Athenians' own interests and those of their allies. The more I think about this sentence, the more carefully constructed it seems -- the parallelism and the positioning of the ἢ's to highlight the contrast between [ὑμεῖς] αὐτοὶ and τοὺς ἐκεῖ ξυμμάχους in the parallel clauses. There's a reason for the "trajection" -- it's not just an arbitrary dislocation. Actually, it probably shouldn't be thought of as "trajection" -- it's only a departure from normal word order if English word order is imposed on Greek. Last edited by Qimmik on Wed Mar 27, 2013 8:16 pm, edited 1 time in total.